The following applies when STORAGE_DEVICE is set to USB Storage. Anytime when the STAN is started, plug a prepared USB storage device into any of the two available USB connectors. It may be easier to do this with an USB extension cable. Note that it is possible to do this during an ongoing recording, without having to end it first. 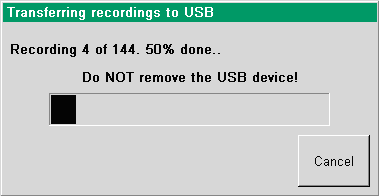 When STAN identifies a prepared USB storage device, a confirmation dialog will first ask whether to start transfer recordings. If you select Yes, all recordings stored temporarily on STAN will be transferred. This may take some time, depending on the number of recordings being transferred and the length of each recording. During the transfer process, a dialog will be visible on the screen, showing the progress in number of recordings and a progress bar. It is important not to remove the USB storage media while the transfer is running. To interrupt an ongoing transfer, press the Cancel button in the transfer dialog first. When the transfer is complete, the dialog will remain for 5 seconds, and then the operation of the STAN device returns to normal. It is then safe to remove the storage media.